Some of the goals for the Grove Restoration Project were to restore beauty and peacefulness to Bachelors Grove cemetery. With community support and plenty of awareness, the cemetery now receives thousands of caring visitors each year. Among those visitors are the many volunteers and relatives of those buried at the cemetery that had come out to lend a helping hand by removing trash and trimming vegetation. Volunteers and other members of the GRP performed activities on public land with prior permission. 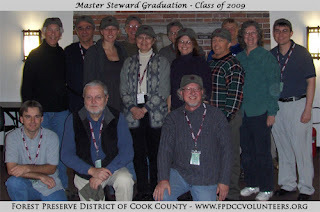 The GRP retired its operations sometime in 2014 when the Forest Preserve District of Cook County resumed maintenance to the cemetery on behalf of the Real Estate Management Office of Cook County. The Grove Restoration Project was unique due to the cemetery and required strategies unlike any other "site" within the Forest Preserve District of Cook County. The area was still treated as a restoration site although the basic rules were under a beautification and clean-up role. The Forest Preserve District of Cook County did not want to endure the costs involved with labeling it as a "restoration" site. Beautification was one way to work around this limitation but required a Master Steward. The Grove Restoration Project was created sometime around 1998 and obtained a web presence around 2000 when BachelorsGrove.com went online. At the suggestion of Pete Crapia, around 2001 the domain name BachelorsGrove.org was purchased by David Berault to help with a joint effort of maintenance for the cemetery. The domain name was eventually transferred to Pete Crapia and became the new Internet domain name for the Grove Restoration Project. The GRP and its website had no direct legal affiliation to any State or Federal Institutions.